Recent changes in legislation will allow boiler owners receiving payments from the non-domestic RHI to replace a broken biomass boiler and still receive payments for the remaining term of their contract. This change will come into effect from 1st October 2018. A force majeure incident (e.g. a tree falling on the boiler house). If a boiler is under performing, broken down, worn out or destroyed then it could be replaced with a new system subject to approval from Ofgem. In such a situation, the RHI recipient can retain the tariff rate they were awarded when they first applied to the scheme for the remaining term of their agreement. Any replacement boiler must satisfy the non-domestic RHI eligibility requirements and up to date emissions regulations. 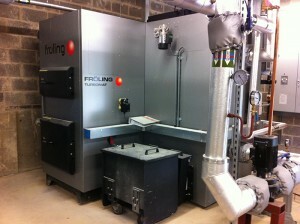 In addition, RHI accredited boilers can be moved from one location to another. In this situation the owner could replace their boiler and retain the tariff or pass on the tariff to the new owner. In the latter case, the new heat use must be eligible according to the current rules of the RHI scheme. This is good news for consumers as it allows flexibility in the rules so that a system that was badly conceived can be replaced with a more appropriate one. Mrs Smith decided on a 199 kW system as the long term plan for her farm was to add some holiday lets and a small swimming pool. Unfortunately, planning permission was not granted so the boiler is too big for the buildings it is heating and is working inefficiently. Mrs Smith wishes to get a smaller more efficient boiler instead. (In this case Mrs Smith could retain her original tariff on a smaller system). Yes, subject to the replacement plant meeting the definition of “replacement plant” and the eligibility criteria of the RHI scheme, the tariff will remain the same irrespective of whether the capacity of the “replacement plant” is equal to, greater or lower than the original plant. In this scenario, any tiering thresholds that applied to the original installation would be adjusted and would be based on the capacity of the “replacement plant” as opposed to the capacity of the original installation. This is to prevent participants who get a smaller replacement plant from being overcompensated. As a result of the RHI tariffs favouring smaller boilers (<200 kW) Mr Williams installed a 199 kW system to provide heating for his poultry rearing farm. The boiler provides a base load and is backed up with LPG. Mr Williams would like to replace his boiler with a larger system than can cover the entire heating load. (In this case Mr William would retain the sub 200 kW tariff he was awarded at the start of the project. Additional capacity would not receive any extra payments). As per the regulations, where a “replacement plant” has a greater capacity than the original plant, it will be entitled to maintain the RHI tariff awarded to the original plant, for any capacity up to that of the original plant. Any heat produced by the capacity beyond that of the original RHI plant will not be eligible to receive RHI support payments. In this scenario, the tiering threshold will not be adjusted in line with the increase in capacity. Instead it will be based on the capacity of the original plant. Mr Jones purchased a 150 kW boiler that he thought was suitable for burning the miscanthus crop he is growing on his farm. Unfortunately, the system doesn’t have an RHI emissions certificate for miscanthus so instead he is purchasing wood chip from a local supplier. Mr Jones wants to replace it with a boiler that is eligible for using miscanthus. (Miscanthus chip has a high volume so a fuel switch from woodchip may require a larger boiler. Mr Jones would retain his original tariff for heat generated for the 150 kW threshold. Any additional capacity would not receive payments). Yes, the participant would continue to receive the tariff awarded to the original plant, and as long as the “replacement plant” is a like-for-like replacement, i.e. a biomass boiler replaced with a biomass boiler, and meets all other eligibility criteria and ongoing obligations of the scheme. The tier thresholds wouldn’t be adjusted in this scenario and any heat produced by the increase in capacity wouldn’t receive RHI payments. If you find yourself in a position where you would like to replace or move your boiler then there are many WHA member companies who can help you with your decision. Please consult the Find a member page.